Our 45-70 ammunition is externally identical to SAAMI spec 45-70 ammo, but internally it generates FAR more power and pressure. 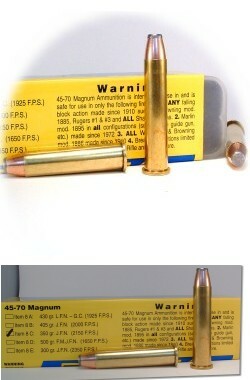 So, our 45-70 ammo will fit into ANY 45-70 firearm but is not safe in every 45-70 firearm. All Marlin 1895 (1895 Marlins are all model 336 actions, chambered in 45-70) iterations made since 1972, all Browning 1885 and 1886 copies, Rossi Rio Grande, New England Arms Handi Rifle, T/C Encore, ALL falling block actions made of modern steel such as Ruger #1 and #3, Shiloh, Christian and Pedersoli Sharps, Henry Lever Action Rifles, all Winchester 1886 iterations made since 1915, CVA Centerfire Rifles and all Siamese Mauser bolt actions. Never use this ammo in ANY original or reproduced "Trap Door" action as the design is far too weak. We use only factory stock firearms in recording published velocities, so you get true, actual field velocities with our ammo -- not exaggerated long laboratory test barrel velocities. Many a Grizzly Bear, Cape Buffalo, Bison and other dangerous game have fallen to our 45-70 loads since we began 45-70 production 1999. Below is an idea of what type of game these loads were designed for. Item 8A -- for game where 5 to 6 feet of straight line non-expanded penetration is needed. Item 8B -- the bullet utilized expands to an inch or more in diameter at our velocities and hence penetration is limited to about two feet in flesh and bone. This is the single most effective hog and black bear load ever devised in 45-70. I don't use it on animals weighing more than 800 lbs as it won't give adequate penetration at bad angles for animals larger than 800 lbs. If you'll limit yourself to broadside (double lung) and CNS hits, this load will work on 2,000 lb animals. Item 8C -- The bullet we utilize in this load is very tough and gives only a small to moderately sized mushroom (about .60 cal) and because of the smallish mushroom, it penetrates very deep -- about 4 feet in muscles and bone and as such is a great bullet for use on dangerous game and on smaller game too as it does expand some. This load is the most versatile of our 45-70 loads. Item 8D -- This bullet is a solid and won't mushroom and thus will penetrate 5 to 6 feet in muscle and bone. Recoil is stiff. But its what you wouldd expect for such a deep penetrating as well as super accurate outta my guide gun. Big bears here in PA. So this is a crossover to whitetail with our overlapping seasons. Not to much damage on whitetails. Clean exit,little meat damage. But still has the sauce for a 5-700 pound black bear. 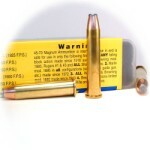 I've used this ammo in a Marlin Guide Gun for the past 4 years (350 gr. JFN) on moose. It typically groups around an inch off the bench preseason. Moose have been taken broadside from 50 feet to 150 yards. Have been able to recover 2 bullets, both just under the hide on the far side of the bull. Very little meat damage, and the moose have not gone more than a step or two before hitting the ground. Just be ready, it will thump you on the bench but you'll never notice the recoil in the bush. This 350gr .45-70 worked perfect on my first Elk Hunt. Shot a trotting elk at just under 100 yards with an 1886 Extra lite. Bullet crushed through a rib on impact and exited out the shoulder after passing through both lungs. The critter died so fast it was already on the ground and out of sight when I recovered from the recoil. Exit wound was smaller than the entry wound; very little loss of meat. The cartridge performed perfectly. I used this ammo on a bison hunt. Two shots one complete pass through one in offside skin. They performed just as they should. 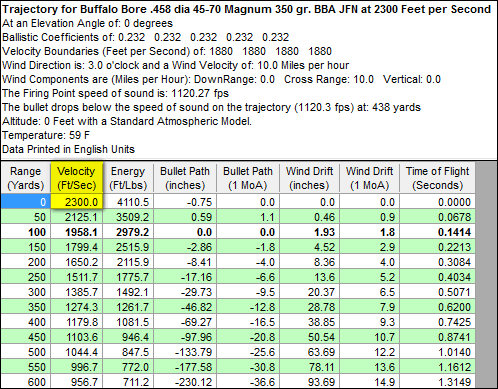 Chronographed in my 28" barrel at an average of 2304fps. 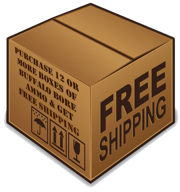 The recoil is not for the faint of heart but ammo perfoms flawlessly. I hunt black bear in Montana with a Marlin 1895 chambered in .45-70 Govt. In addition to black bear, the area that I hunt is also occupied by grizzly and mountain lion. My ammo of choice is the Buffalo Bore 350 gr. JFN. Although the recoil is fairly significant especially when shooting off of a bench rest, it is very reassuring knowing that my ammo is both accurate and effective.